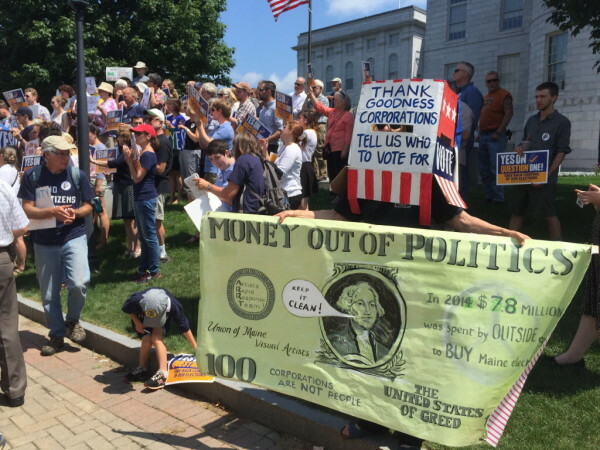 Dozens of volunteers and activists turned out at the State House on July 28, 2015, to kick off the Yes on Question 1 campaign, spearheaded by Mainers for Accountable Elections, which supports campaign finance reform. The “Clean Elections Initiative” would increase public funding for qualifying candidates for office to as much as $3 million to make them more competitive against privately funded candidates, according to supporters. The existing law, passed by voters in a 1996 ballot initiative, made up to $2 million available to candidates for statewide office. The initiative proposes to beef up disclosure rules, requiring political advertisements to list their top three donors. It would also strengthen penalties for violating campaign finance law. The controversial Maine ballot question underscores the increasingly tense national debate over how best to regulate campaign finance in the wake of Citizens United, the landmark 2010 U.S. Supreme Court case that allowed unlimited independent spending by corporations and labor unions in election campaigns. Opponents of the Maine initiative, including Republican Gov. Paul LePage, point out that the proposed law does nothing to limit spending by outside groups, chiding the measure as a subsidy for undeserving politicians. “The real question is: how much of your hard-earned tax dollars do you want to buy lawn signs, make robocalls to your house and send junk mail?” LePage wrote in an opinion piece co-authored with two Republican lawmakers. Maine’s statewide system of full public financing was the first such program in the United States, but participation rates have dropped by more than 30 percent since 2006 as outside money has flooded state elections. In 2014, independent groups including political action committees spent at least $14 million to sway Maine voters, more than the candidates themselves, according to Maine Ethics Commission filings. The pattern is the same nationally, according to Katy Owens Hubler, of the National Conference of State Legislatures. Only Connecticut and Arizona have programs similar to Maine’s, Hubler said.